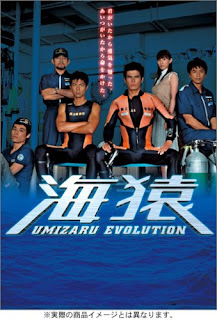 Cast: Ito Hideaki, Kato Ai, Nakamura Toru, Sato Ryuta, Tokito Saburo and Natsuyagi Isao. This drama is the follow up on the movie after the recruits become coast guard divers. A year has passed since Senzaki Daisuke (Ito Hideaki) became a coast guard rescue diver, but has still not been in an actual rescue operation. When his transfer to the 3rd district is decided, he is thrilled to find out that it is in the same city, Yokohama, as Kanna (Kato Ai) his long distance girlfriend lives in, but for some reason she doesn’t want him to come Yokohama, even though they have been mailing and talking to each other. Not only that: his new buddy Ikezawa Masaki (Nakamura Toru) is a veteran, who has no interest in him, basically not seeing him as an even equal. The drama is a great follow up on the movie. The vibe and the mood is pretty much the same, and you really start idolizing these people who not only sacrifice their life, but also jeopardize their family life and relations. The story is not as action packed as the movie, but tries really hard to make it interesting and realistic, which I believe they did very good. The lead couple has a good chemistry with one another; somehow they just seem to be a really good duo. The drama has that emotional feeling to it, which makes you tearing, heck even cry - I know I did. I would recommend it, but it probably would be more interesting if you watched the first movie.